“Zombies in Yorkshire? Really?” I declared, as I chatted on Facebook Messenger with Alexandra, the Moscow-based producer of the Russian TV series, Mysteries of Humanity. I was contributing as a subject-matter expert, and had just received my questions for the next episode. “Are you serious?” I continued, fearing the show had crossed the line and gone from the sublime to the ridiculous. “Just Google it,” Alexandra insisted. With trepidation, I did. I was immediately captivated by the bizarre discovery of zombies in an abandoned medieval village in the north of England. Wharram Percy was its name, and the proclamation that the undead had once tottered across the Yorkshire moors had only just hit the press. I was impressed that the Russian research team had picked up on the story so quickly. The internet reports were tantalising, and predictably over the top: the ‘Village of the Damned’, they called it. It seemed that archaeologists had discovered in a pit bones which had been cut, broken and burnt in a manner that matched descriptions in medieval texts describing the treatment that a corpse received if it was believed the deceased would return and terrorise the villagers after death. I was dumfounded by the assertion that a village in Yorkshire may have been laid waste by a zombie apocalypse. “How could that possibly be?” I wondered. 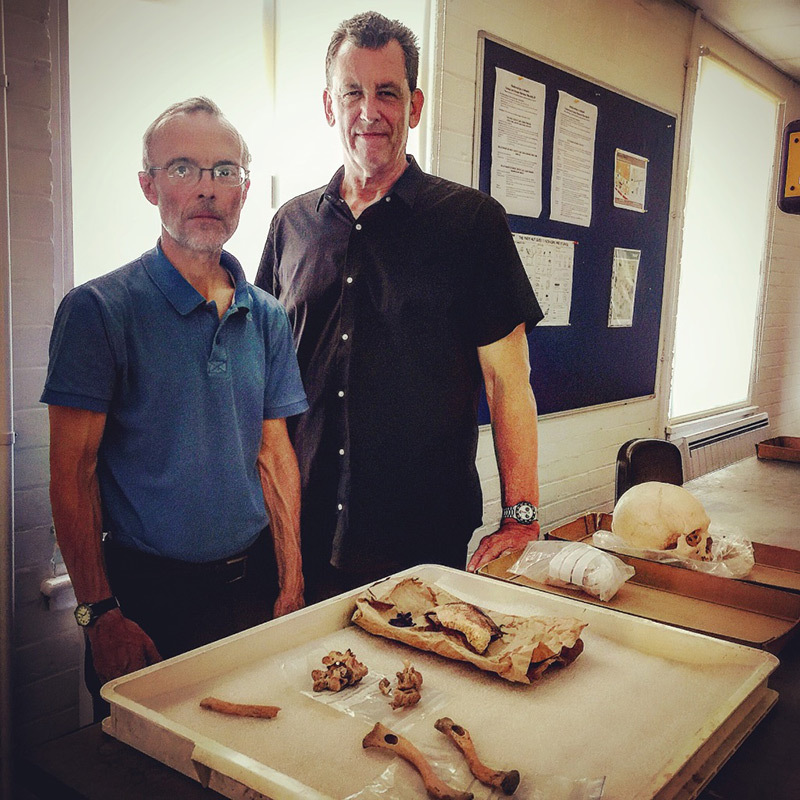 “Surely, there must be another, more plausible explanation.” Nevertheless, if true, then the so-called zombie bones in Wharram Percy hold the key to the first archaeological evidence for the belief in the undead, in England, in history. I did my pieces to camera for Russian television, deflecting my uncertainly about the discovery with my usual cinematic enthusiasm, and finished the shoot wanting to know more. As luck would have it, in three weeks I was presented with my opportunity. What on Earth? is the most popular show on the Discovery Science Channel (SCI), and I had contributed to the first three series with in-depth studio interviews; my usual talking-head gig. The premise of the show was to examine peculiar satellite images and determine what they depicted on the ground – not what they appeared to be from the air. For the fourth series we were sprinkling the episodes with on-location shoots. When SCI called, I always said yes – and on this occasion I could not believe my luck. I had worked with Rory on numerous shows, not just What on Earth?, and was pleased to receive his call. “Zombies,” he added, timorously. 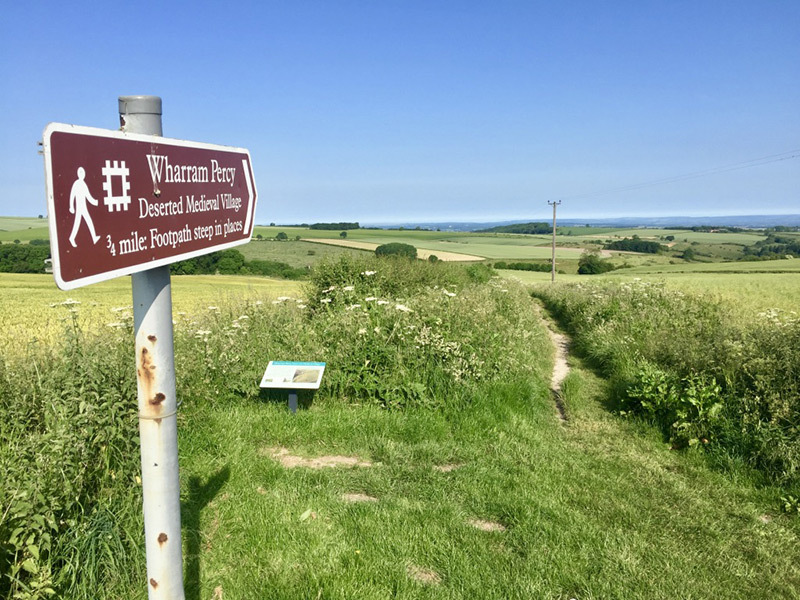 “What I mean is, there is this place in North Yorkshire called Wharram Percy,” he explained, as if he was defending himself. I get to examine zombie bones? How cool is that, I thought. We arrived in Wharram Percy at 8am, ready to roll. There was only one problem – actually, there were two: it was mid-summer and it would soon be the hottest day on record. As a result, the walk to the village was brutal; a mile-long slog with no shade, through a bug-infested underbrush. If that were not problematic enough, our ‘fixer’ was nowhere to be found. The latter merely exacerbated the former, for the ‘fixer’ is vital to the success of any film shoot and, as the title implies, he or she is responsible for fixing any number of logistical issues that arise before, during or after the filming. They also carry the heavy camera equipment. For reasons known only to my ego, I believe I look edgier when I wear black. This stylistic crutch would soon backfire, however, for on the hottest day of summer I was forced to take my dripping wet, black shirt off and walk into the countryside carrying the heaviest camera equipment imaginable. Mercifully, three quarters of the way to the village, the fixer appeared. Apparently, he had been to the site early, to recce it, lost track of time, and was only now returning to greet us. His arrival was a blessing, for he was young and keen to relieve us of the burden of dragging our equipment down to the village. Nevertheless, the damage had been done. I was ringing wet and covered in mosquito bites. It was 9am and I was already shattered. I wanted to take a shower and go back to bed. The temperature was rising fast and I was struggling to dry off. Still, I was excited to have arrived at our destination. “So, this is the Village of the Damned.” I uttered beneath my breath. Images of Brad Pitt charging over the hill while disorientated zombies trolled behind him raced through my head. Clearly, I should not have watched World War Z just before the trip. Shirt in hand, I headed off to explore, while the Discovery team prepared the shoot. “Do not take pictures of me like this!” I shouted, humourlessly, as a cameraman took still photos of me in my pathetic state, allegedly for promotional purposes, but more likely for blackmail. I snickered to myself how diva-like I sounded, and smirked at the thought that I was becoming an inconsolable TV luvvie, like so many others. 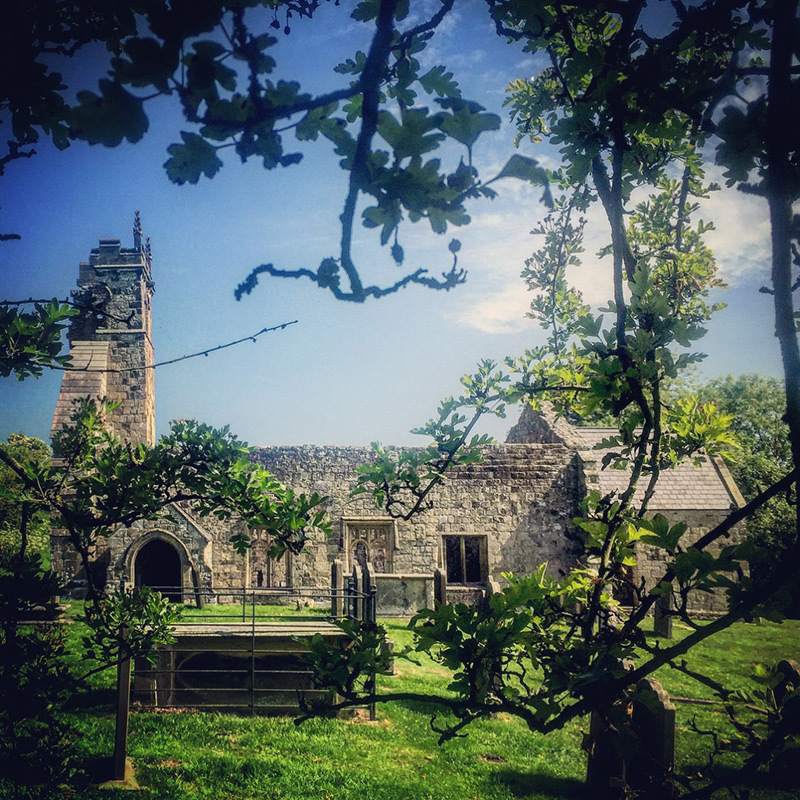 In its heyday Wharram Percy had been a thriving village consisting of some forty properties and a population in the region of two hundred. They had hunting lodges and all sorts of amenities. They even had a fine Norman church, the remains of which are still visible. The ruined church was hauntingly stark and the only thing in the village left standing. I measured its orientation and found it slightly off the traditional east/west axis. I reviewed the site map from the archaeology report on my iPhone and cross-referenced the salient locations in the landscape. To the south was a pond and, by all accounts, it had been there for a thousand years or more. 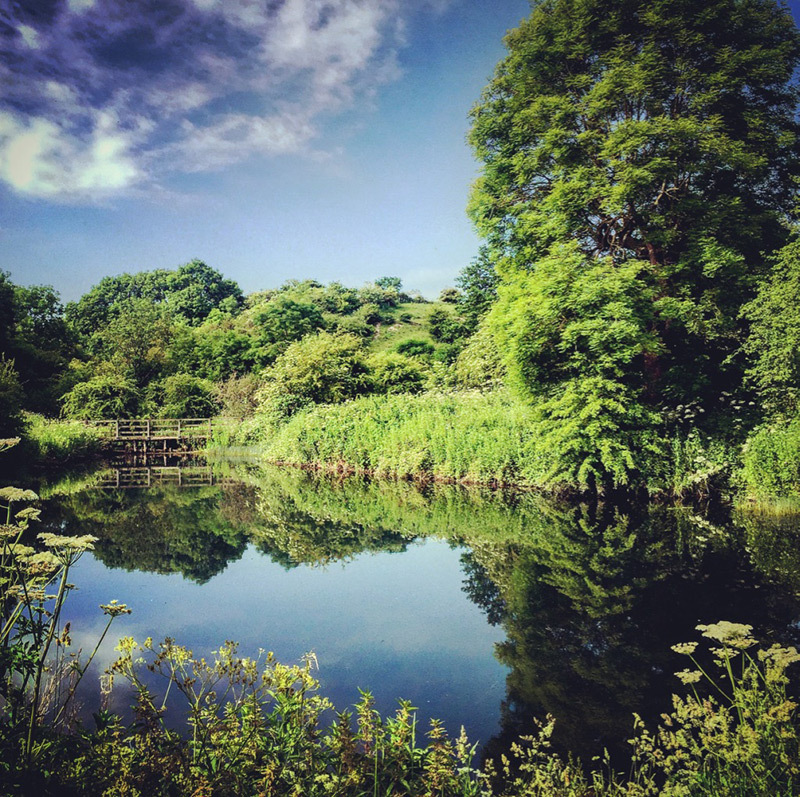 Although a small stream ran just to the east of the church, there was no spring in Wharram Percy, and so the pond would have been an essential source of water. I wondered if it had played a role in the ritual cleansing of the zombie corpses. I also wondered if I was losing the plot with the whole zombie thing. “George Romero has a lot to answer for,” I mumbled to myself. 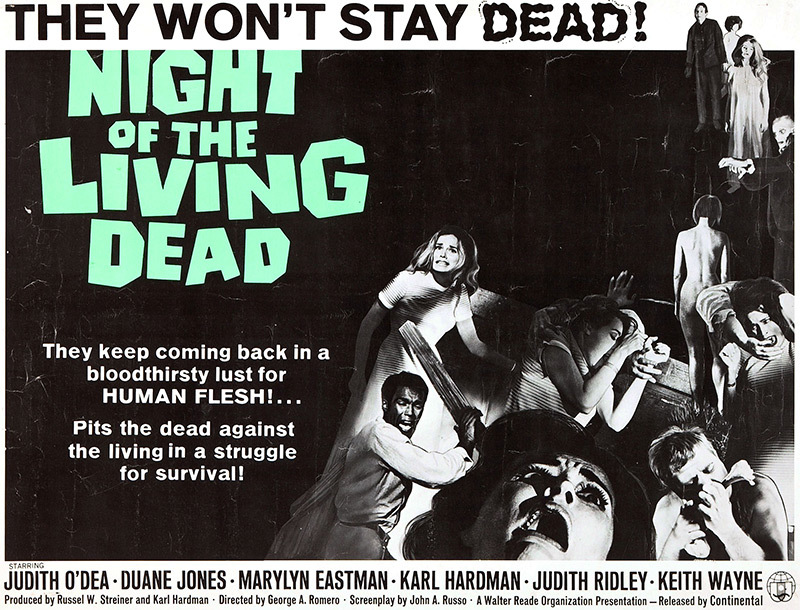 Clearly, his genre-founding 1968 film, Night of the Living Dead, was the genesis of my generation’s unwavering obsession with zombies. But here I was, investigating possible real-life zombies. I was enjoying myself more than I really should. Directly west of the church, and up a steep incline, was the ancient homestead of Wharram Percy. I proceeded up the hill, still shirtless, but relieved not to be carrying anything other than my iPhone, and my soaking wet, black shirt. My goal was to locate the spot where the archaeologists had discovered the pit of zombie bones and, according to the report, I would find it just off the southern end of the western row of adjoining fifteenth-century domestic buildings, known as long-houses. I panted faintly as I laboured up the hill and contemplated the layout of the village. Something was not right. Why was the church in the valley, and the village on the plateau above it? Were traditional villages not situated the other way around, with the church on the plateau and the valley below? The archaeological survey was precise and I found the spot where the zombie bones had been discovered with ease. As I surveyed the setting, I delighted in telling the hikers who ambled past the story of the zombie bones. They loved it. Much to my surprise, I was stirring up zombie-mania in deepest, darkest Yorkshire. You couldn’t make it up. My phone vibrated and I could see I had a text from Rory. “What’s going on up there?” he asked. Evidently, the film crew had heard the whooping and hollering above. “Nothing, really,” I typed. “I’m trying to get rid of these obnoxious tourists.” Of course, I had lied. The truth was we were having a laugh. The hikers moved on, undoubtedly pleased with their zombie-pit selfies. I savoured the solitude and studied the setting with renewed focus. I noticed that the location of the zombie pit was in line with the tower of the church a hundred metres to the east. I confirmed the alignment with the compass app on my iPhone. It was precise. I also noticed that the zombie pit was the only place where the top of the church tower was level with the land. Was this significant? I wondered if the alignment of the church with a pit of zombie bones was the villagers’ way of sanctifying the bones of the undead, without having to place them in the consecrated grounds of the churchyard. I made a note to ask the archaeologist about it the following day. For the next nine hours we filmed our scenes at Wharram Percy, without so much as a branch of shade. As the day wore on, our remote and barren set resembled a spaghetti western more than it did a Yorkshire hillside. We rationed the water, not because we were thirsty, but because my shirt was ruined from perspiration and required constant dowsing from the camera man. At this point I would have welcomed death by zombies. The heat was soaring over forty degrees centigrade and, despite the arduous conditions, the episode was shaping up nicely. The journey we were guiding the audience on would undoubtedly inspire the imagination. 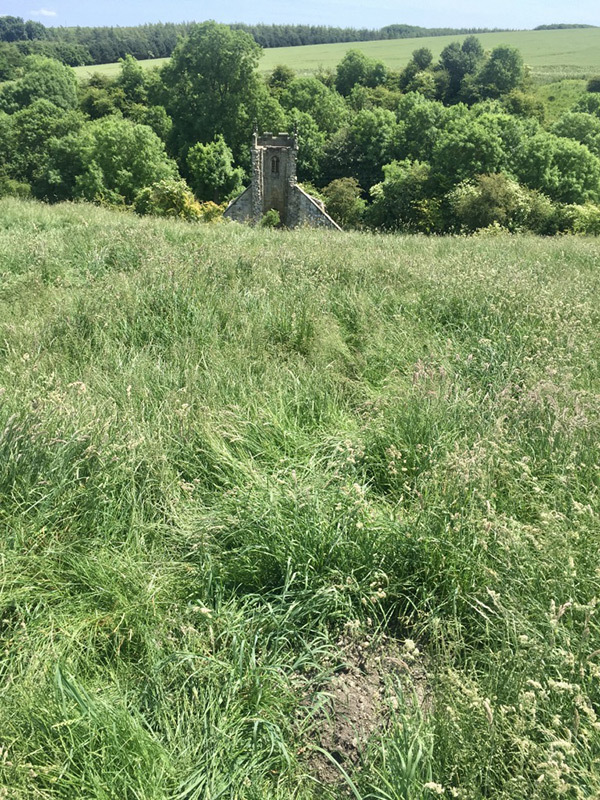 The question we were asking was, why was Wharram Percy abandoned? It appears something catastrophic had happened, but what? That was my quest. Records of Wharram Percy go back as far as the Domesday Book of 1086. As I did my pieces to camera, I considered whether it had been abandoned due to the bubonic plague (the Black Death, as it would later be called), which had ravaged England during the village’s heyday in the fourteenth century. At least one and a half million people died of the Black Death in England between 1348 and 1350 – that’s more than one third of the population. Around this time, the population of Wharram Percy was reduced to under fifty. By 1368 the buildings of the North Manor were dilapidated and considered worthless. Residents could have been forgiven for thinking it was the beginning of the end, but counterintuitively, the people who survived the Black Death were better off than they had been before, because they now had more land to live on. Might the bones in the pit have been the remains of individuals who were believed to be plague carriers, I wondered. I explored other potential explanations and pondered the possibility that the bones might have been cut, marked and burnt from battle, for the fields near Wharram Percy had witnessed one of the bloodiest clashes in English history, a mêlée from the Wars of the Roses known as the Battle of Towton, which was fought on 29 March 1461. The Wars of the Roses were the real Game of Thrones, and I deliberated as to whether it was the reason the village had been abandoned, and if the remains of the village heroes were thrown into what we are now calling the zombie pit. Like the plague-victim hypothesis, it seemed a viable explanation. However, there were still villagers in Wharram Percy in 1500, so something besides the Wars of the Roses must have killed the inhabitants of the once-prosperous homestead. The unfolding of our story continued. I considered alternative explanations for the abandonment of the village, including famine, and the possibility that the burnt and strangely cut bones in the zombie pit were the result of cannibalism, or even vampire burials, like the ones that were so prevalent in eastern Europe, also in medieval times. I even contemplated whether the bones represented some sort of ancestor-worship cult. Finally, I asked the inevitable question: was the village abandoned due to zombies? Had zombies infiltrated Wharram Percy and forced its inhabitants to flee? 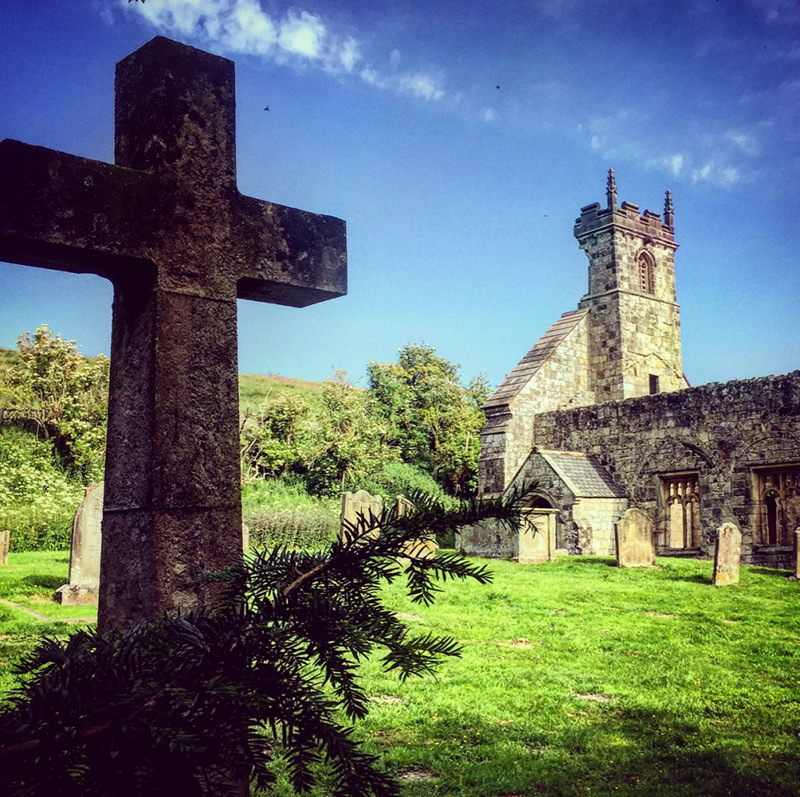 Was Wharram Percy truly the site of a ‘zombie apocalypse’? I finally revealed the most surprising, albeit anticlimactic explanation of all. 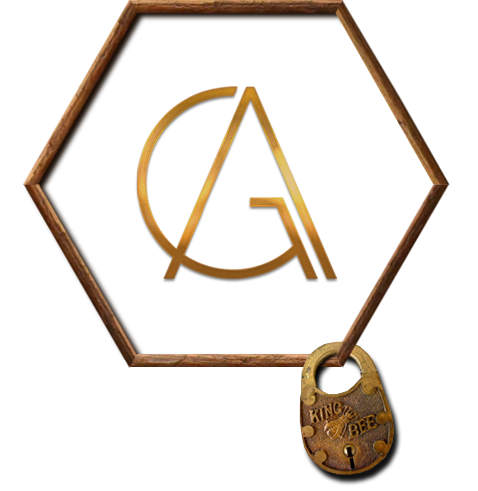 Occam’s razor would be satisfied once more. The reason the village was abandoned was due to sheep, not zombies. A Court record states that Baron Hilton of Wharram Percy evicted the last four householders from their homes in 1517 – and he did this to make way for sheep. In 1543–4 John Thorpe of Appleton kept 1,240 sheep under the care of just two shepherds on Wharram’s former arable fields. In lawsuits of 1555–6 relating to the rebuilding of the vicarage after a fire, none of the witnesses lived in Wharram Percy. It had officially become abandoned. The irony was that the poor villagers had withstood everything life had thrown at them. 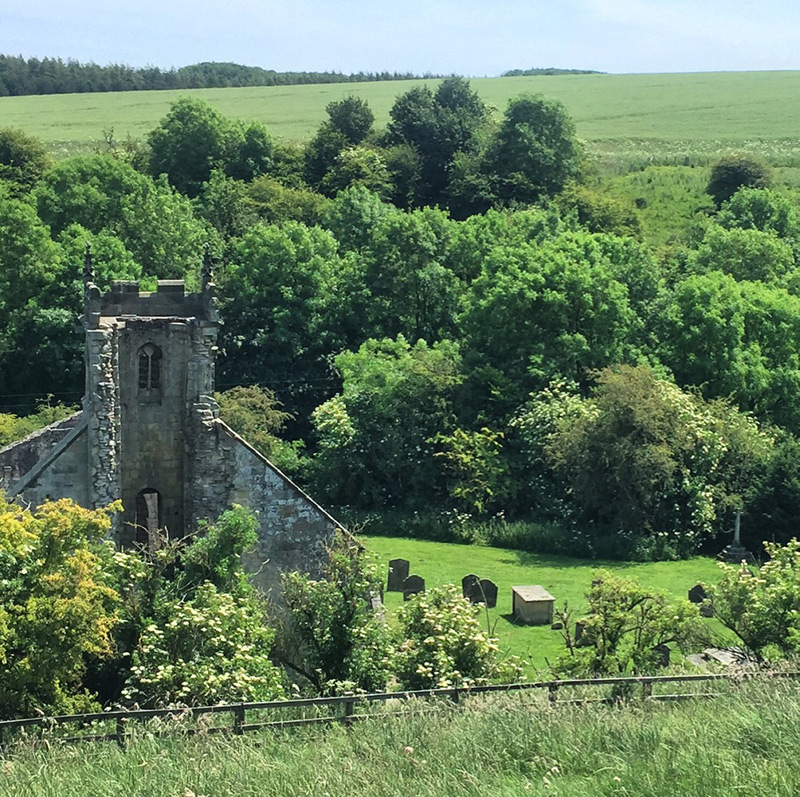 They had survived plague, famine, war, even zombies (allegedly), but what the resilient residents of Wharram Percy could not withstand was capitalism. The price of wool had skyrocketed, and sheep had become more valuable than humans, and so the once flourishing village of Wharram Percy was reduced to fields of sheep; future sweaters, trousers and winter coats for the elite upper class. The plague of profit had annihilated Wharram Percy, not the Black Death, and certainly not zombies. I worried that the viewers would revolt when presented with the cheeky explanation that sheep, not zombies, had caused Wharram Percy to become abandoned. But we were not done yet. There was still no explanation for the pit of zombie bones and, as far as I was concerned, it was all still to play for. Was the claim that zombies once terrorised Wharram Percy legitimate or not? I needed to know. That night I savoured a local Yorkshire ale, ironically known as Black Sheep, while I washed my disgusting black shirt in my hotel room sink. “Oh, the glamour,” I thought. The next day, we would drive to Portsmouth and meet the archaeologist. 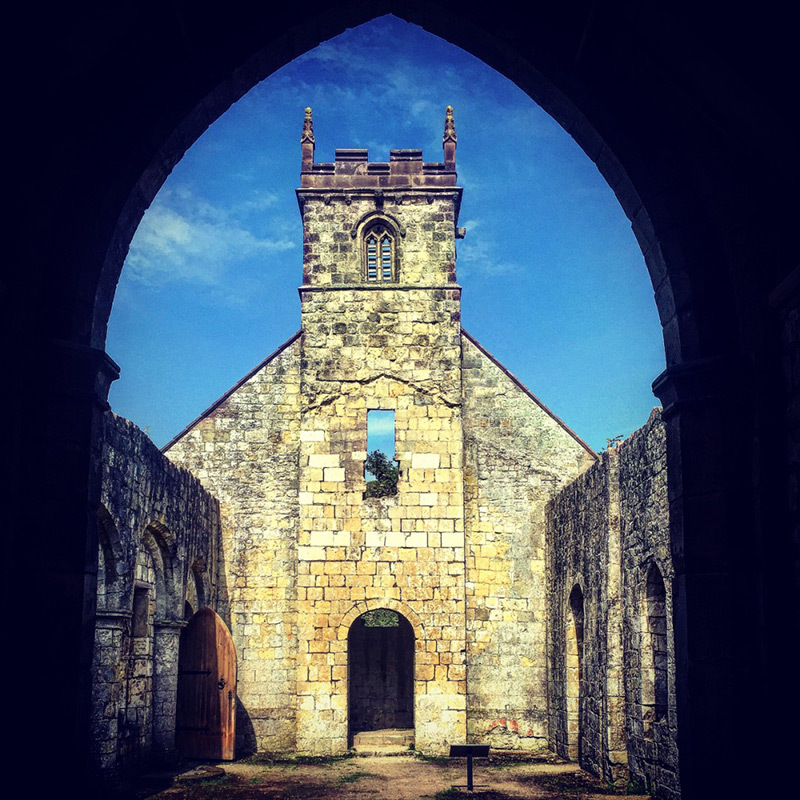 I reflected on what I had learned at Wharram Percy and prepared a list of questions for the man who had created all the hoopla. The next morning we departed for Portsmouth in the usual manner: the Series Producer drove, the Director sent emails from his perch in the passenger seat, and I curled up in the back and studied the archaeologist’s report, which was entitled, ‘A multidisciplinary study of a burnt and mutilated assemblage of human remains from a deserted Mediaeval village in England’(Journal of Archaeological Science: Reports, Mays, S., et al.(2017)). I learned that the chap we were heading to see was not an archaeologist, but rather a human skeletal biologist at Historic England. His name was Simon Mays. The report made for great reading. It was scholarly, but not dry. It was unapologetic, but never lost track of the fact that what it was saying was controversial. I learned there were not one, but three, square, interlocking pits, and that they were discovered by archaeologists in 1963. The central pit was 2.1 metres wide, while the pits on either side were half that size. 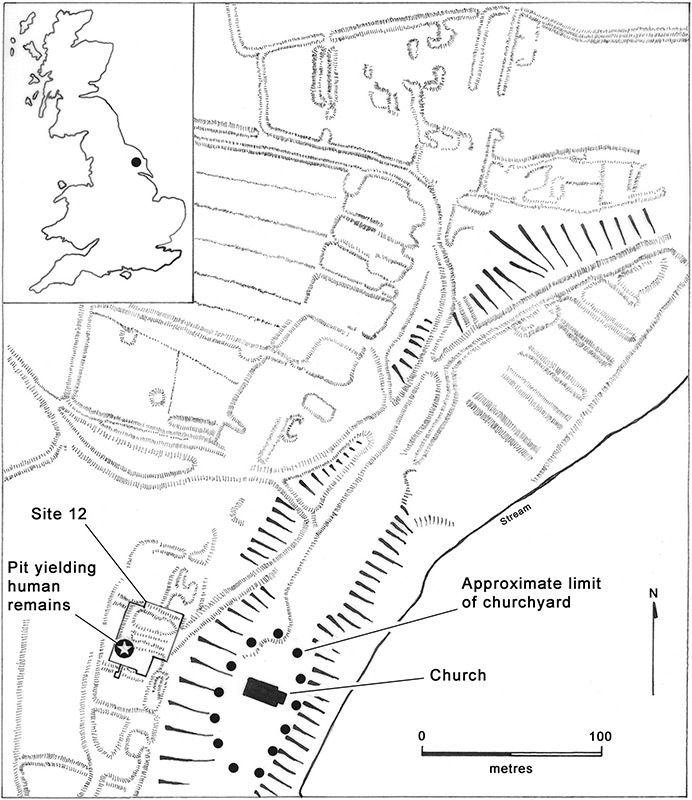 Curiously, the zombie pit ‘complex’ predated the fifteenth-century long-houses it adjoined. I found this curious, as I had originally wondered why the pit was constructed so close to the long-houses. Now, I was wondering why the long-houses had been constructed so close to the zombie pit. 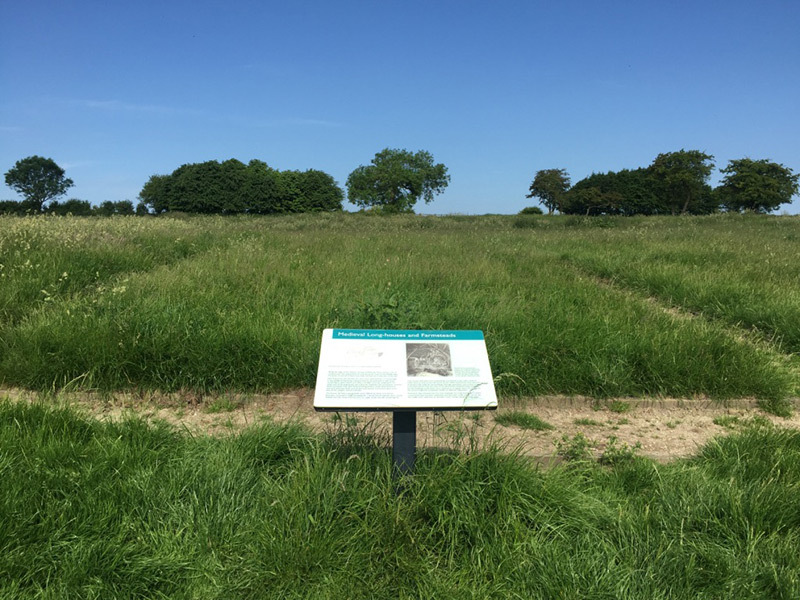 The original site report stated that the ‘remains were Romano-British burials inadvertently disturbed and reburied by villagers in late Mediaeval times’. 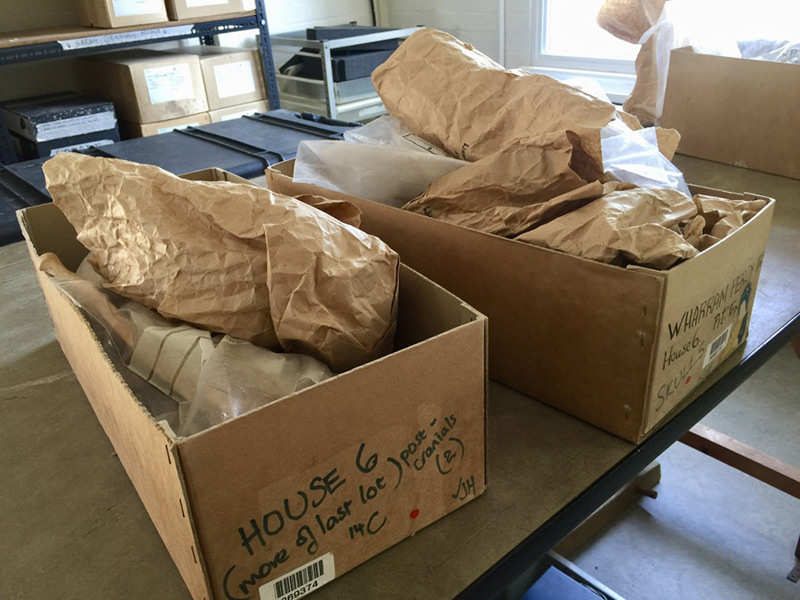 In other words, the bones were redeposited here from other locations nearby. That is, this was not the site of their original interment. They had been dug up, mutilated and reburied in the pit on the bluff overlooking the church. I continued reading. The burials appear to date from the eleventh to the fourteenth centuries. Simon detailed the find: ‘the whole collection consists of 137 bones representing a minimum of 10 individuals: six full adults (two females, two probable males, two unsexed), one possible female who died in her late teens/early twenties (above enumerated with the adults), one subadult in their mid-teens, one child aged about 2–4 and one aged about 3–4 years.’ In other words, the pit contained bones from both sexes, and all ages, but represented only a subset of the body parts of the deceased. Most curious of all, Simon’s analysis determined that the remains had been deposited over a period of 160 to 475 years (95% probability). Many of the bones had been burnt after death, especially the skulls and the upper body, and many had been inflicted with peculiar knife marks, often at regular intervals. 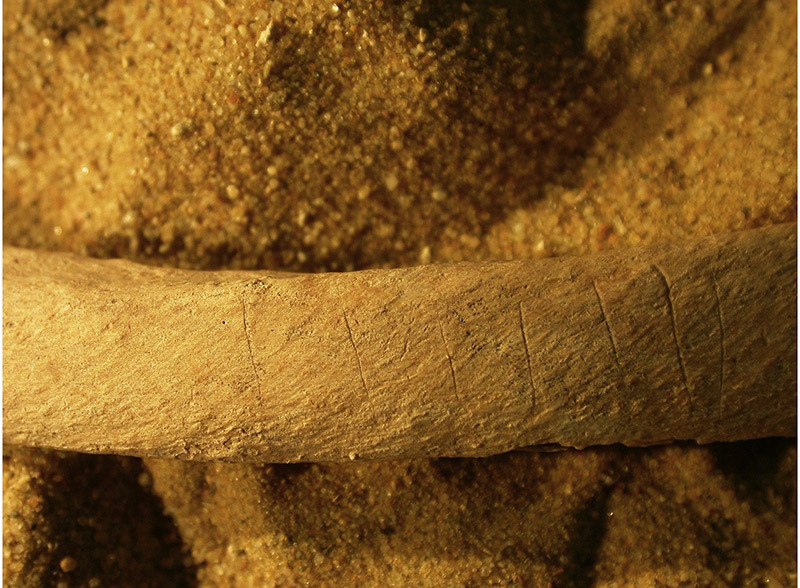 Others had been deliberately broken, but not in a pattern consistent with cannibalism, which tends to see breakage in bones along the major joints. Cranial remains were the most common, and markings on the bone suggested decapitation after death. In short, it appeared that they had been dug up, hacked to pieces, and throw into a pit. Simon believed that what he was looking at were the remains of revenant corpses, which he described as, ‘a re-animated corpse that arises from its grave’. Surprisingly, it appears that the belief in such creatures was not uncommon. Revenants were capable of inflicting harm on the living, it was believed. They were malevolent, disease-carrying creatures who had come back from the dead and needed to be respected and, of course, feared. Simon adds, ‘reanimation arose as a result of a lingering life-force in individuals who committed malign, evil deeds and projected strong ill-will in life, or who experienced a sudden death leaving energy still unexpended.’ He also describes how, in mediaeval texts, the revenant is a fleshed corpse – not a skeleton – and that it is during the period between death and flesh decay that the body poses a threat to the living. To protect oneself from potential attacks by the undead, it was necessary to dig up the body, cut its head off and, if possible, rip out its heart. Simon’s report referenced several historical examples, including the twelfth-century account of William of Newburgh, a Yorkshire monk, who recounts the tale of a revenant corpse that roamed Berwick, England, at night. The story goes that the visitations stopped as soon as the locals dug up the body, cut its head off and burnt it. I was fascinated by Simon’s findings and eager to meet him. 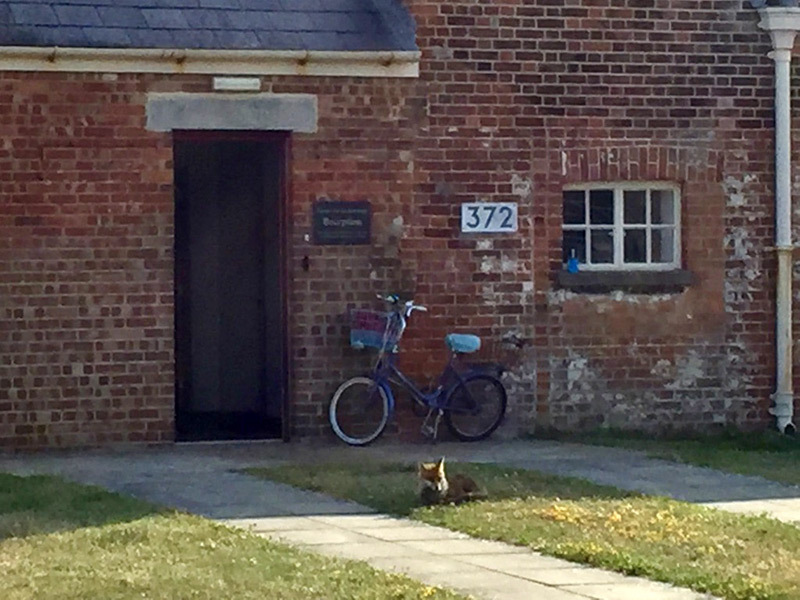 As we drove along Portsmouth harbour and turned into Fort Cumberland (an eighteenth-century pentagonal artillery fortification that now serves as a research establishment for archaeological studies, including Historic England), I was astonished to see a large fox guarding the door to Simon’s office. The fox seemed approachable enough, but I was not about to test its mettle. As I exited the car and walked cautiously in its general direction, I learned that it had a name. “His name is George,” shouted a stocky-looking man walking towards the fox – I mean George – with a plate of food balanced in his raised right hand, like a Parisian waiter. “He’s our mascot. And his favourite meal is sausages,” the man broadcast proudly, if not defiantly. Who knew, I thought, and before I could say ‘Little Red Riding Hood’, I was told that Simon would be right with us. Simon and I hit it off straight away. 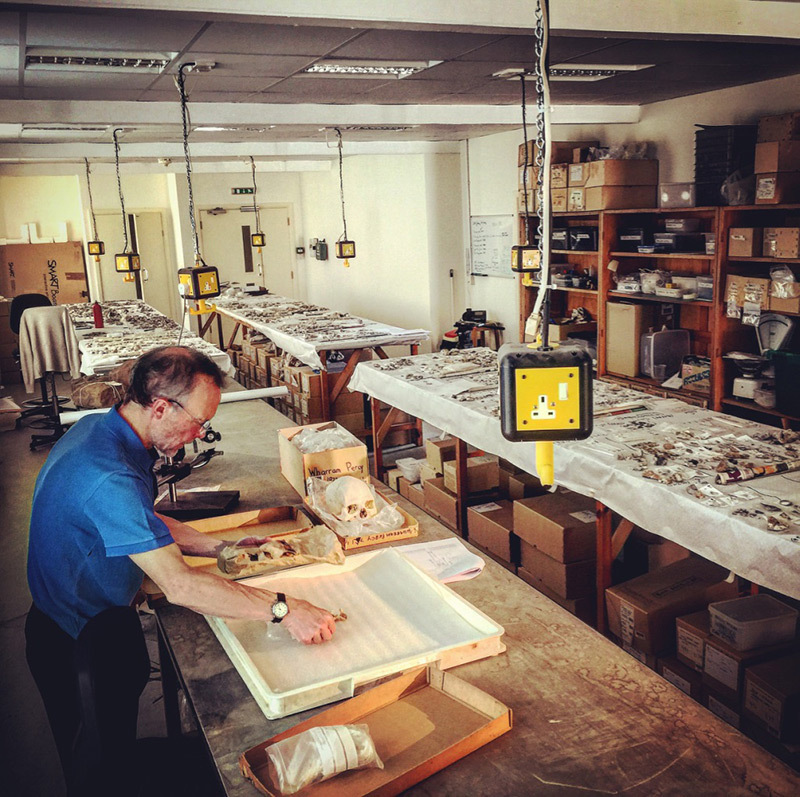 We were engaged in a rather intense conversation for nearly thirty minutes before Simon removed a sample of bones from several weathered-looking cardboard boxes labelled ‘Wharram Percy’ and stepped me through his analysis. Rory asked us to put a halt to our increasingly vibrant exchange, “I’m loving this debate, but let’s save it for the shoot, ok guys?” We did as Rory asked, and enthusiastically picked up where we had left off as the cameras began to roll. Our conversation was easy, fluid and natural. I was genuinely interested in what Simon had to say, and neither of us was inhibited, let alone conscious of the fact that we were being filmed. I asked Simon why the church was in the valley, beneath the settlement above it, and not the other way around. He informed me that this was because the church was built over an ancient earthwork. I continued with my inquisition and asked if he thought it was significant that the church was aligned both vertically and horizontally on the precise location of the zombie pit complex. He spiritedly denied that this was significant, dismissing it as coincidence. I liked Simon a lot. He was switched on, pragmatic and willing to let the evidence guide him. He had no emotional investment in the direction his research took, and it was clear he had taken a chance in associating his findings with the belief in revenants in the first place. Academia can be cruel, and unforgiving, but Simon did not seem worried. He had performed his due diligence and let the bones speak for themselves. We were coming to the end of our interview and I had one final question. “Why has this only just come to light?” I asked. 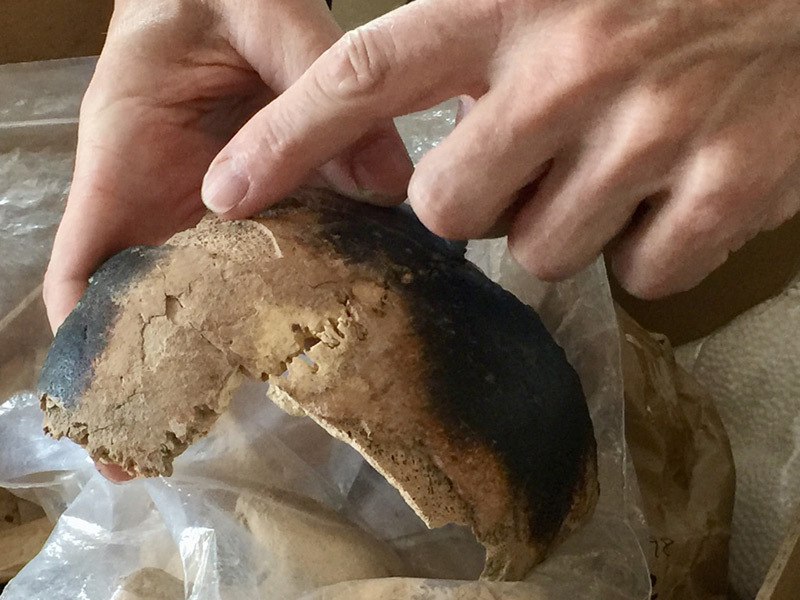 “I mean, given that the pit was excavated over fifty years ago, why have anomalies in the bones only just been discovered?” Simon said he had looked at hundreds of bones from Wharram Percy over the last twenty years, but these particular bones had remained hidden, tucked away in a box on a shelf. My thoughts sped back to the final scene of Indian Jones and the Temple of Doom, when the Ark of the Covenant is placed in a crate and stored in a warehouse – presumably for eternity. What if someone with Simon’s unique skills had never been given the chance to examine the bones, I thought. We would never have had archaeological proof that medieval England believed in zombies, that much is certain. 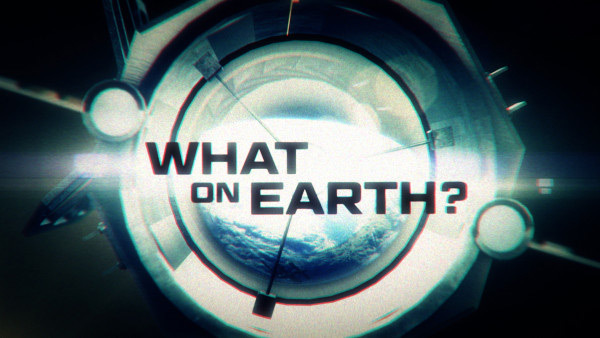 The episode of What on Earth? Series 4, featuring my journey to Wharram Percy will be aired on Discovery Science (SCI) in late autumn / early winter 2017.